It's Wednesday, the day of our favorite show of all time-ish! The Masked Singer will reveal the identity of another masked singer tonight, which means it's time to pull out our collection of clues to start agonizing over them once again. Three singers have been unmasked so far after losing out on audience votes after their performances, and we can't say we were sad to see them go or shocked by their reveals. The Hippo was the first to go, and he was revealed to be Antonio Brown—NFL wide receiver, DWTS alum, and a guy famous for getting in trouble for his touchdown dances. The Pineapple left next, and no one was truly surprised to find out that the weed-smoking Hawaiian-themed goofball was Tommy Chong. Last week, The Deer took off his mask, revealing himself to be former NFL player and current Fox sports commentator Terry Bradshaw, whose name was trending after his very first performance on the show, so that was also not a surprise. All are relatively well-known names, but no true celebrity superstars as of yet. We've now heard every single competitor sing at least once, and half have sung twice and given us two sets of clues. Some of these sets of clues made sense, and others have only made us more confused, and all we really know for sure is that we know nothing, and we're having a good time. E! 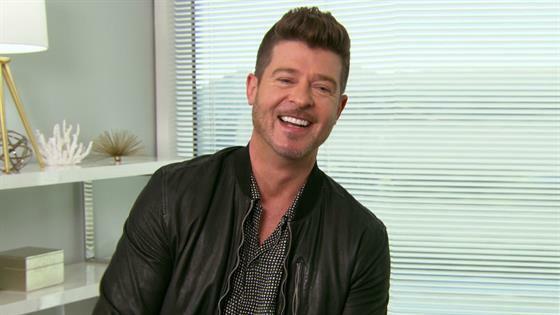 News had panelist Robin Thicke in studio this morning, and of course, he couldn't spill a single word on who's under those masks. What he could say was that the reveal that shocked him the most came in the last episode. "The most shocking reveal is actually in the last...at the end. I was blown away by the last episode," he said, only able to tell us that whoever it is is a "superstar." So we've got a ways to wait to be as shocked as Robin Thicke was, but in the meantime, we've got a whole bunch of clues to parse through, starting with the mysterious singers we know the most about, simply because we've seen them perform more than once. UPDATE: Another singer has been revealed! Scroll down to see all the new clues from Wednesday's show. Check back with E! News after the episode to discuss the reveal and all the new clues!